In January, contractors broke ground — or floor, rather — at Palazzo Pio. After many years of planning in coordination with the facility owner, Istituto Tata Giovanni, renovations are now underway at the UW Rome Center. Staged in three phases, the project includes critical updates to the structure, electrical and mechanical works; important fire safety prevention measures; as well as new lighting, flooring and educational technology. 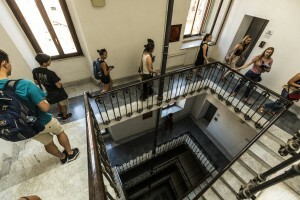 The renovation also maximizes educational space so that future generations of UW students can participate in the transformative experience of study abroad in the heart of Rome. Phases 2 and 3 include similar work, all with an eye for improving the usability of the space for our academic programs, conferences and other educational activities. Classes and programming are in full swing during the renovation. To make room, we have repurposed and consolidated other spaces, including “the Prow” on the 3rd floor and the library on the 4th floor. We will continue to welcome UW programs the renovation, and we encourage faculty to come and see first-hand the transformation underway in Rome. While some flexibility may be required around classroom assignments, programs scheduled at the UWRC this summer, early fall and autumn will be accommodated in existing classroom space. Applications for future programs are also very welcome! Bookmark this page for updates, and consider visiting us to check out the work in progress. We’d also love to show you the beautiful results once the project is completed.